RSI Advantage – RSI - Road Systems, Inc. Think about it: if you’re responsible for several different kinds of terminals, each with its own unique components then you have to keep every single one of those unique components on hand in inventory for repair and replacement. But if you install several different kinds of terminals that use mostly the same components, you can greatly reduce your inventory — since most parts will have multiple applications. That’s the simple philosophy behind RSI’s SKT, FLEAT and FLEAT-MT lines: fewer unique components = smaller inventory = cost savings. 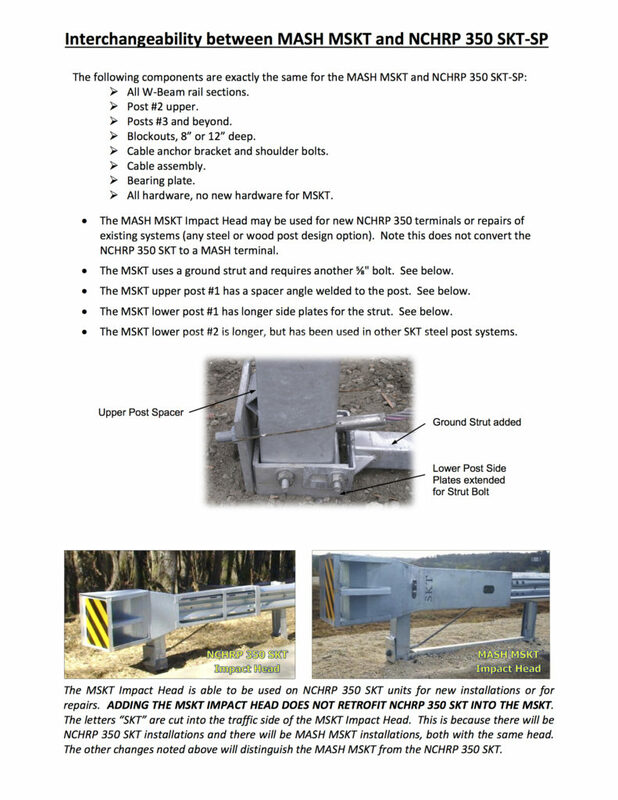 The MASH MSKT impact head can be used on any NCHRP 350 SKT. We lead; others follow. Road Systems Inc. products will always be on the cutting edge of lifesaving technology. Impact heads are lightweight and easy to work with. Their unique design means they’re more easily removed from damaged barrier than comparable systems. Parts interchangeability…ease of installation, maintenance and recovery — all lead to a lower bottom line. Road Systems Inc. products are designed by the same engineers who pioneered the science of energy-absorbing end treatments. No other company has the degree of expertise and experience of our personnel. Our technical support, marketing and sales staffs work closely with Designers, Consultants, State Departments of Transportation, Counties and Municipalities, and Contractors to achieve innovative and cost-effective safety solutions. Road Systems, Inc. offers the most comprehensive service in the highway safety industry. When you need us, we are there. Just let us know what you need and we will support you 110%. RSI is active on many National committees on Highway Safety including ATSSA, Task Force 13 and TRB Committee AFB20. Road Systems provides training to support your needs.